Tanoue Shinya was born in Kyoto, the cultural heartland of Japan in 1976. 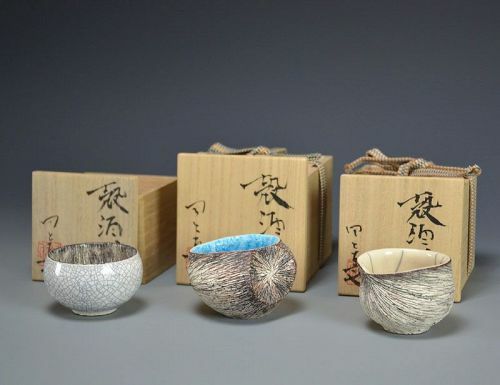 He garnered a BA from Doshisha University in Theology, and after two years in a textile company, an Associate in Fine Arts from Saga Art College in 2003. He has a list of private and group exhibitions very impressive for his age, including the Mino Ceramic Park International Ceramic exhibition (awarded 2005), Asahi Modern Craft Exhibition, Design in Ceramic Vessel Exhibition in Aichi, Nihon Togeiten National Ceramic Exhibition, (Awarded 2007) and Asahi Ceramic Exhibition, (Awarded 2007). Gendai Togeiten National Modern Ceramics Exhibition. His work has been exhibited in the United States, France, Germany, Hong Kong Italy and many others. His work is held in the collections of The Museum of Kyoto, The Museum of Ceramic Art in Hyogo, INAX Tile Museum, Minneapolis Institute of Arts, Tweed Museum of Art and the Los Angeles County Museum of Art among others.